All Hallows Eve (Halloween) is in a few days, and we remember the costumes and outfits we’ve seen over the years. Maybe there was a costume you may have worn or something elaborate your children or grandchildren had donned to celebrate the day. So scare up a costume and write about it. Night becomes your residence, your dwelling. It is telling that you find your comfort here. Fear does not invade. It has been forbidden. your costume serves to repel all hell dwellers. sanctuary from all scary apparitions? Besides, what is your position on the macabre? protected by the shadows and stars. remnants of shouting and fighting. Halloween night is your safe and welcome haven. Seek your shelter there, sure and secure. and her heavily dimpled smile. and she, the sunflower of same. she sees fit to visit. NB: I will be away must of today and thus not able to participate much, if at all. Good poemming, folks! Yes, it is well disguised, Bill. But your proficiency is never hidden. Enjoy your day, and we look forward to your next offering! William, sweet, melodious and concise. William, this throws a startling contrast into the mind. Masterful. In your own words, “indeed”! Yes, Autumn’s costumes are superior! the most unique getup ever seen in the neighborhood. an elfen form draped in a brown paper bag holding a pumpkin. waking any souls daring to sleep on such a night. Such a memory to hold! And so beautifully written, Linda. A favorite of all you’ve presented this month! I love it, especially the toothless bag of groceries. Delightful! A child’s creativity grows up into a poet’s skill. Perfectly done Linda. This reallyy makes me smile Linda. Very expressive! 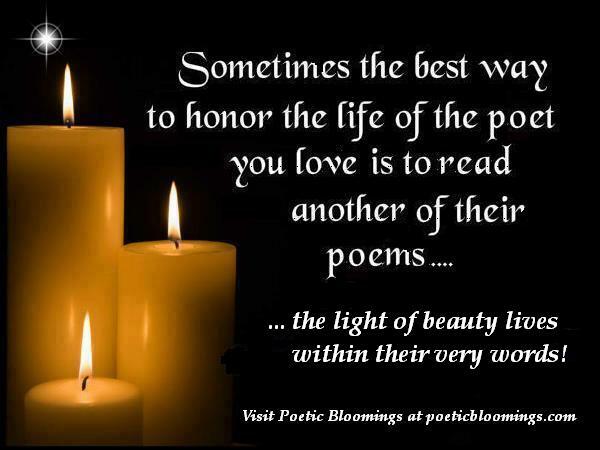 Marie and Walt…loved reading your offerings. Walt, seems sunflowers bloom in both our lives. I have a photo of my third daughter with the sun mask she made in middle school standing in my garden. What a blessing to have sunshines to keep us warm! Blessings! Thank you Linda! And love your sweet story! visible but not yet tangible. she decides to show herself. their daily trips to and from the dump. Daniel, you paint a lovely picture of the appearance of fall and the excitement. What a perfect character sketch of this season “more suited to satisfaction / than excitement.” Marvelous work, Daniel. Oh Daniel, this is delightful…I can see it so clearly and hear it too! Well penned! PS…left you an answer to your answer on yesterday’s page! My-oh-my, do I love this! Your ending, quite the surprise. Beautifully penned, Daniel! Love how you present the slow presentation of autumn. Peeling back layer-by-layer, you’ve exposed the season beautifully, Daniel. Carolyn, captured (or resurrected) beautifully. Trick or treat and costumes where a while different activity “way-bay-when…”. Nicely remembered Carolyn. We have similar memories! So much simpler. Carolyn, what wonderful memories! Yes, I remember we never had store bought costumes…always created. My girls, as you could see in the poem above, did the same. I loved that the neighbors knew us all and called us by name back then. Now…so different. Sad, really. Thanks for sharing you memories in a poem well penned! The sweetest memory, Carolyn. Mom would sew our costumes. Elaborate and fine. The neighbors looked forward to our visit, to see what mom had created for us. I had taken up the mantle when my girls were born. The sunflower was one of them. Both are pride inducing, Daniel. The sisters are the best treats one could have, Halloween and throughout the year. those tree skeletons fit the celebratio, for sure! 🙂 we are surrounded by tree skeleton. Oh! What a wonderful image!! Excellent writing, Marjory! How well you paint your image with words, Marjory! Thank you, Marie. No energy to paint with paints so use words instead. And the story continues, beautifully, Marjory! Thank you. Indeed Walt, inside the mask, “in the dank and dark” is often a safe house from what we see thru eye holes. Marie, your challenge to demask is straightforward. Earl, you took us in a completely different direction with you skillfully crafted poem! What a reminder to us all to be our authentic selves…if we can. The last two lines just grab me! Thank you for your poem! Awesome! Earl, our own hearts a disguise…what a thought. Well done. Interesting twist, Earl. An unexpected turn. Another pearl from Earl! My son was always a superhero. than lookig just like a Marvel character. It didn’t matter if it was or wasn’t Halloween. My daughter was ever changing. Her creativity could not be contained. until she could make them by herself. a dragon, a snake and a rainbow. she and her chef friend did a duet at each door. I was never comfortable in a costume. I don’t like to be other than who I am. costumes reveal exactly who they are. well said! and I love your children’s costume choices .. Yes! I think you may be correct! My bagful of groceries has grown to be the mother of two active boys and an artist with a following! She creates all kinds of whimsical characters, and gets paid for it!! Linda M.R. I love the “rest of the story!” That’s awesome! And Linda S., your poem captured me, and held me for a moment. Wonderfully penned! Super hero, unicorn to lobster what fun memories to hold and share. Thank you. I remember once being a pumpkin! Linda, Wow! This turnaround thought at the last was a clincher. Yes, costuming is expression. Great poem. Not one fond of costumes for myself either, Linda. But the girls always enjoyed what we could create. I think my reticence to costumes underlies not wanting to find out exactly who I am. I love the mystery of me. Awwww….It is like that in so many places. Miss the simpler days. Your poem is a walk down memory lane for me. Well written! Oh wow. Only the shrubs. A punch to your poem, Candy. Well done! Waning nostalgic here, Candy. Loved this, and more times than one Mom sacrificed an old white (sometimes beige) sheet to the ghoul I was to be—for one night. Sad in a way that our youth was left behind in such wonderful memories. But revisiting it at this time of year sort of carries a warmth that penetrates us. Thanks for the memory, Candy! Walt and Marie, you poems really hit home today! As has yours, Candy. Thank you for your kind words. Maybe – and a very cute one! You’d be a Poet Tree! not flex my muscles, no powers flout. This brings loads of smiles and sweet memories. This is super, man! Good one, Damon. I Kent deny it! I love this Damon. Our dreams don’t die, but they sure do change! I’ve played at being adult. Dressed up as monsters or in gowns. Intent to scare or to astound. They guessed me for my big, brown eyes. Costumed as burglar, oh so cool. Dressed all in black to surely fool. At Scouts, a clown with round, red nose. Thick curly wig and floppy clothes. But You know how the story goes. from all people she knew. in childhood truths newly told. to cover the pain of her past. by the mask of the years. And since this prompt is COSTUME, here is the poem I wrote that fits the prompt. My head must have held on to Marie’s title and so I was working on MASK.